Wondering what can make you stand out at a wedding? We got GQ Fashion Director Vijendra Bhardwaj to tell us what to wear to a wedding, if not the sherwani. It’s your friend’s wedding, and you’re mulling over what, if not for the ubiquitous traditional tog – the sherwani. Well, first thing –the sherwani is a GQ favourite, and we quite often recommend it for dressy evenings, especially weddings. When it’s well-cut – By which I stress upon it being sharp: firm shoulders and a slim fit (which means cut close to the body and not tight) – it’s the ideal gentleman’s long coat for dressing up. But the pertinent question here is – what of the man who doesn’t go by the narrative, and finds it a tad bit staid? But still wants to look sharp. So, when one drifts away from the tried-and-tested sherwani, are there options out there, that are occasion appropriate, but feel contemporary and progressive? Of course. Here, I’ve plucked five alternatives from the designer collections showcased at Van Heusen + GQ Fashion Nights. Go for an eclectic look from Rajesh Pratap Singh – An indigo print jacket paired with wide-leg volume pants. Style tip: For a modern, sharper vibe, I suggest the look to be paired with solid-heel shoes like brogues or loafers, rather than flat ethnic juttis. Try contemporary Indianwear by Shantanu & Nikhil – This navy and brick red kurta has a sport vibe and is perfect for the guy who doesn’t like to fuss around with jackets. When paired with slim churidar trousers and embroidered loafers, it’s a win-win look. 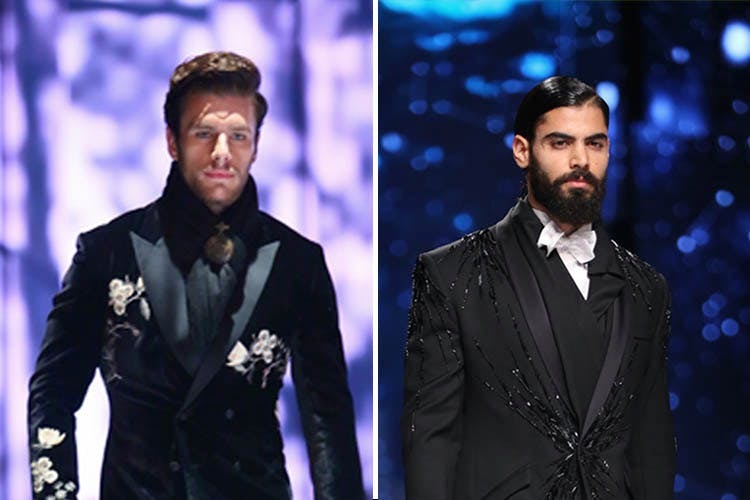 Go for a tone-on-tone embellished tux from Gaurav Gupta – it’s great for a modern rake vibe at your sharpest night out. A floral embroidered velvet jacket like this one from Rohit Bal reflects a chic, regal vibe. Keep it dark (black, midnight blue, deep burgundy or bottlegreen work best), wear it in a monochrome fashion (similar tones, head to toe) and always, remember – velvet is kosher when worn at night. Part bandhgala, part sherwani, a double layer wrap detail and a touch of texture-blocking – go for an asymmetric jacket from Rohit Gandhi + Rahul Khanna. It’ll ratchet up your style ante and make you stand out, in a very good way.